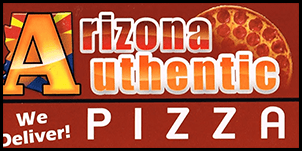 Online ordering menu for Arizona Authentic Pizza. At Arizona Authentic Pizza we strive to bring our customers the best and highest quality pizza, wings, salads and more! We use only high quality and fresh ingredients! Try one of our specialty pizzas like the Arizona Supreme, Hawaiian, Bacon Ultimate, or the Mexican Pizza! Order online for carryout or delivery! We are located near downton Phoenix, a few minutes west of the Phoenix Zoo, and Phoenix Sky Harbor International Airport.